Watershed has what you need. You can buy the Simple English Propers in hard copy form. 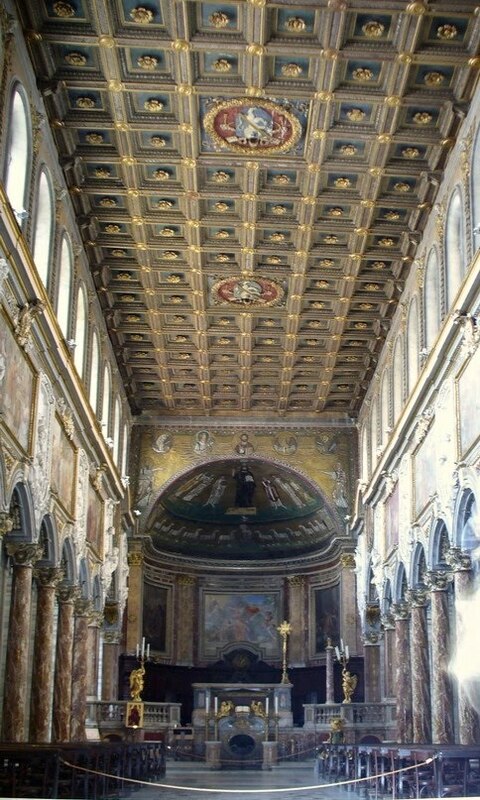 I was contacted recently by a reader, a priest who had concelebrated a Station Mass at San Marco di Campidoglio in Rome. He had noticed a square halo on one of the figures in the 9th century mosaic in the apse and wanted to know the reason for this. 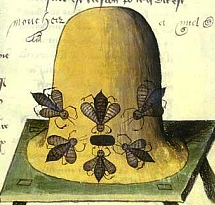 The figure, he told me, was Pope Gregory IV. 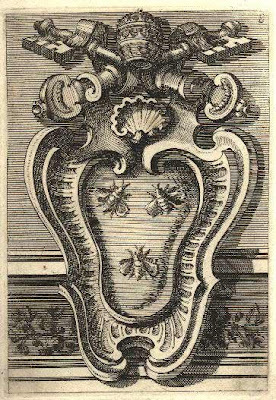 A square halo signifies that the person portrayed was alive at the time of its creation. Although this church was founded long before Pope Gregory himself lived, he was responsible for much rebuilding, the bulk of what we see today. 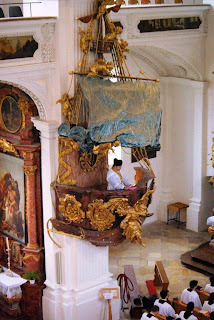 This is why, I am guessing, he is also portrayed carrying a church. We see also a very clear example of what my teacher Aidan Hart always referred to as hierarchical perspective. 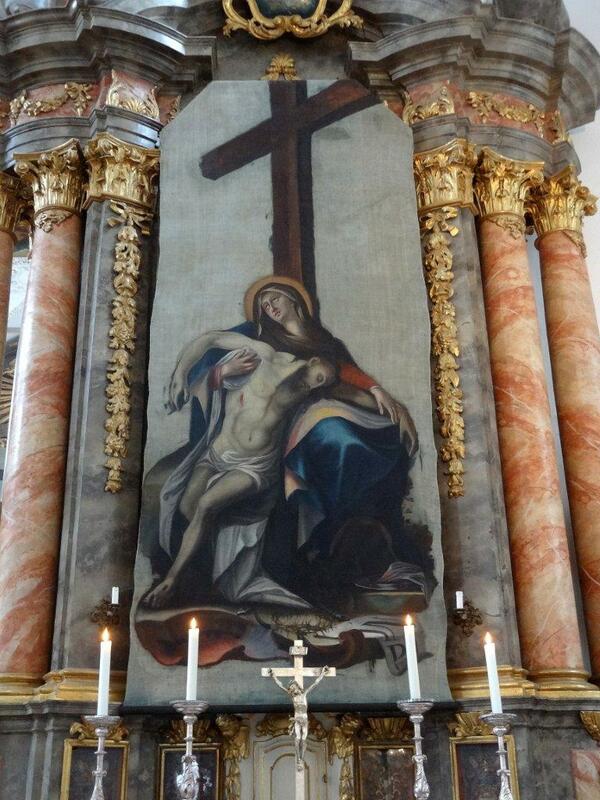 The most important figure portrayed, Christ, is by far the largest. 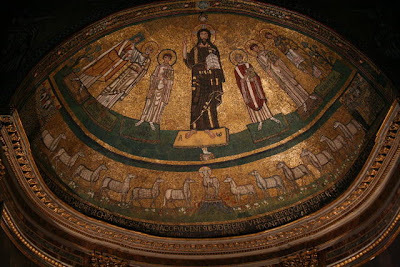 Also we see the Evangelist himself is putting his arm around the Pope in a touching detail that gives more of a sense of personal tenderness than one normally associates with iconographic mosaics of this type. This is church is not always open to the public so it is interesting to have this insight into the interior. 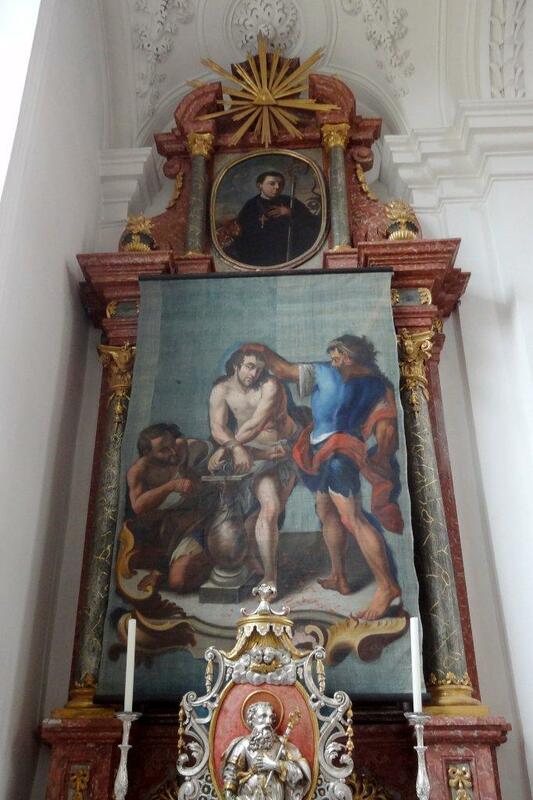 The Scourging at the Column. The Roman influence on this 18th century painter is very evident not only in the human figures, which are strongly reminiscent of Michelangelo and his contemporaries, but also in the manner of depicting the column. The church of Saint Praxedes in Rome preserves a small column (probably a piece of a once larger object) venerated as the Column of the Flagellation, similar to the very short piece in this painting. 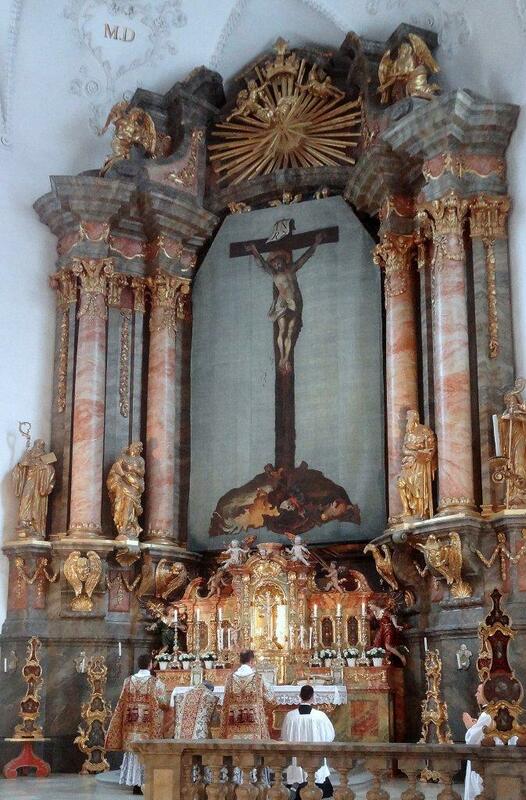 The Crucifixion over the main altar. 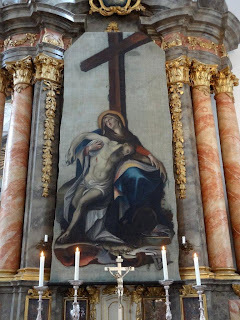 The Pietà. This work is also clearly reminiscent of Michelangelo, particularly in the graceful form of Christ's body. The church’s pulpit is a shaped like a ship, complete with anchor, sails and rigging, one of only four such pulpits in Bavaria. 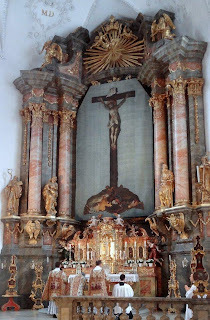 Vespers was done later the same day in the church of St. Blaise in nearby Kaufbeuren; the main altar preserves a very elaborate Gothic altarpiece from 1528 by the sculptor Jörg Lederer. As you know, Pope Benedict XVI has recently been in Mexico, followed by Cuba. I picked up this interesting little tidbit in a Reuters story, "What does a pope do?" Fidel Castro asks Benedict. I find the fact that Castro asked this question interesting. 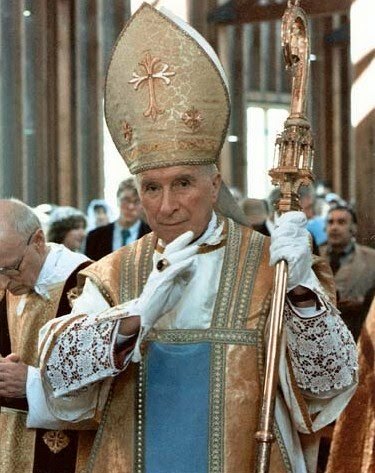 Without having full benefit of the conversation, my sense is that this somehow speaks, whether directly or indirectly, to the reality of the effect, and hence the gravity, of changes to the sacred liturgy and why such cannot be done arbitrarily, either by legitimate authority (cf. CCC 1125), nor certainly by any member of the church, lay or clerical, on their own whim and initiative. I'd be rather interested to hear what book the Holy Father will recommend. 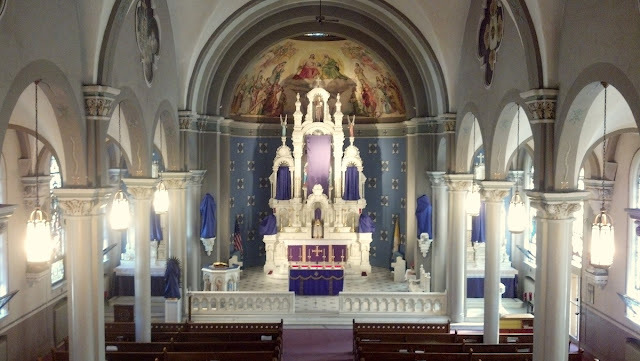 An Altar of Noble Beauty: The Altar of the Shrine of the Blessed Sacrament, Washington, D.C.
We've shown you this tasteful altar before in another context, though I'm not certain we have ever specifically made a point of highlighting the altar itself. Here are two views of it, taken this past Sunday. Not only does she consider it the central focus of the whole liturgy, the raison d’être of the building in which its stands; not only does she indicate that the church exists for the altar, rather than the altar for the church; not only does she look upon it as the sacrificial stone, upon which Christ, our Priest and Victim, offers Himself daily in His Eucharistic Sacrifice, which is the central act of her liturgy; but she has proclaimed again and again that in her mind the altar represents her Lord Himself... and the reverence for the altar, expressed in the restraint and dignity of its design, symbolizes the reverence due to Christ Himself. 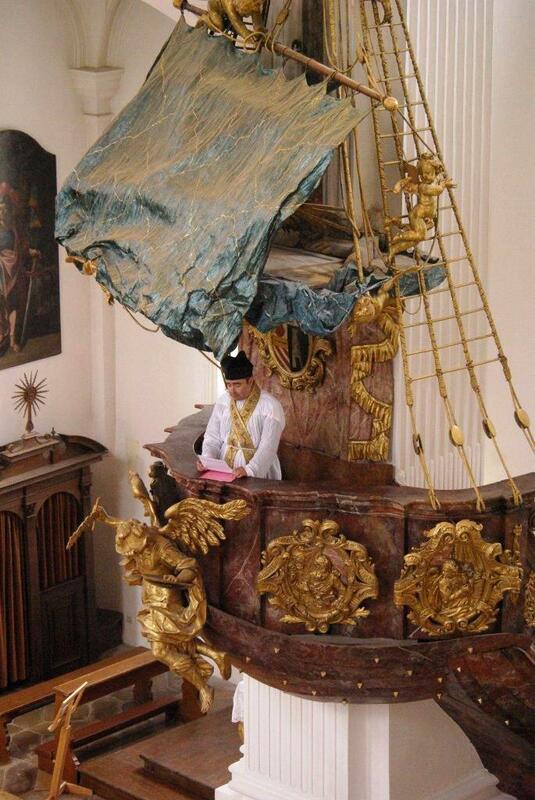 Holding such a truth as this, it is not surprising that the Church should legislate for every detail of the altar, and should strive to exclude confusion and vulgarity of design as she tries to restrain sentimentality and frivolity in music. I believe this particular altar fits very much into Webb's description of an altar that avoids vulgarity, expressing both a restraint and dignity in design which is befitting the sacred liturgy. I don’t remember how I happened upon it while surfing the Web, but it was a pleasant diversion. It’s an essay, published in 1890, written by Dr J. Wickham Legg, a vice president of the St Paul’s Ecclesiological Society (as in St Paul’s, London). Though the author and his intended audience were Anglicans, now long deceased, his commentary is not without relevance to Catholic liturgical renewal, past and present. The variations in the ceremonies practiced in the celebration of the Eucharist make a division into two heads easy: missa solemnis and missa privata. 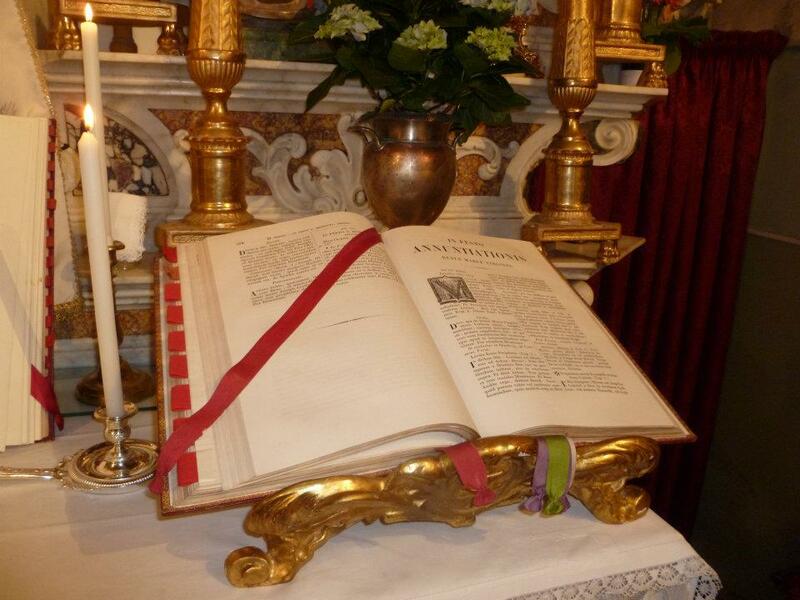 The missa solemnis is the public, or High Mass, and gives us the rule for the celebration of the Eucharist. The priest is assisted by a deacon and sub-deacon.... 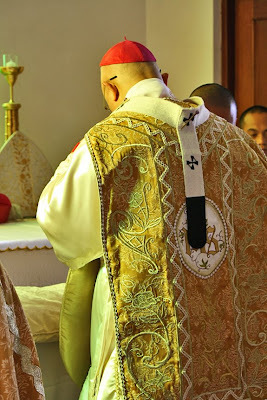 The private, or Low Mass, on the other hand, must be regarded as the exception, and in this the priest is assisted by a server only. 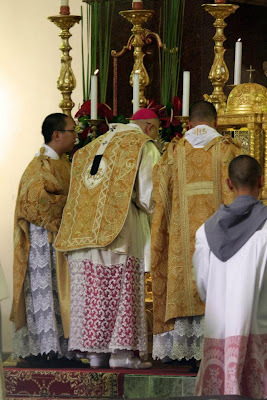 It is the presence of the deacon and sub-deacon which makes the difference between High Mass and Private Mass, and not whether any part of the service be sung. 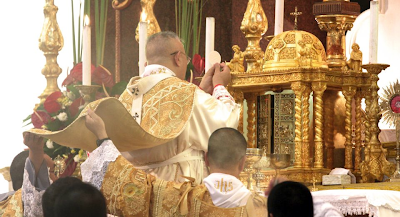 Now, it cannot be too often repeated that it is only High Mass which gives us the ancient, typical ceremonies of the celebration of the Eucharist, and from which we may learn the true idea of the Eucharistic rites. 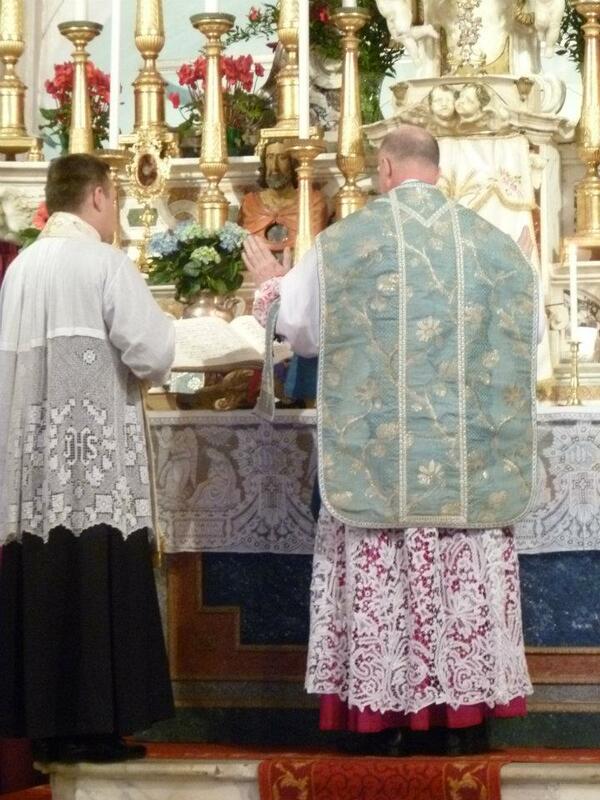 Low Mass only gives us the rite in a maimed and imperfect, not to say corrupt and irregular way. 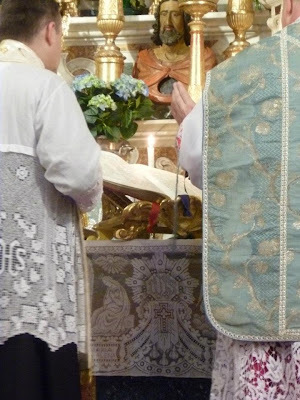 Private, or Low Mass, that is, a celebration of the Eucharist without deacon or sub-deacon, was as little known to the Church at large for the first 800 years, as it is to this day to the Eastern Church. It seems to have come in when Latin ceased to be understood by the people, who betook themselves, therefore, to their private prayers. Low Mass robbed the medieval church of the idea of common prayer, which it is the glory of our Prayer Book to have brought back. The celebration of the Eucharist in private (I am only using the word still used by the Roman Missal) shows but small respect to the Christian mysteries. It may be borne with in country parishes where there is no one in holy orders but the curate himself, but to see in a church with a large staff the altar served by some boy taken out of the street, who probably does not know his Catechism, and has not been confirmed, while men in holy orders are doing nothing in the stalls of the choir, or only come into church to distribute the Communion, shows that there is little or no zeal for the solemnity of the Eucharist. It shows a contempt for the practices of antiquity, to which in all questions of ceremonial, as well as in faith and morals, the Church of England appeals.... 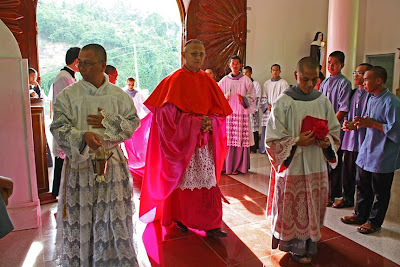 Even the more learned Roman Catholic authorities dislike the boy server, and tell us that it is the deacon who is the proper minister of the altar. —“On Some Ancient Liturgical Customs Now Falling Into Disuse,” in Transactions of the St Paul’s Ecclesiological Society, vol. 2 (London, 1890), 123-24. I would contest only one point (apart from Anglicanism’s claim to apostolicity and catholicity), based on my reading of Fortescue and Jungmann: the evolution and spread of Low Mass had less to do with Latin than with the fact that more monks were becoming priests and needed to say Mass daily—concelebration not being an option at the time. Obviously the full complement of liturgical ministers could not be provided for each celebration, so the celebrant himself supplied the parts of the absent ministers, while the people’s parts were divided between the celebrant and server. Low Mass grew out of those “private” Masses and in time became the most common form of celebration, even when the faithful were present. 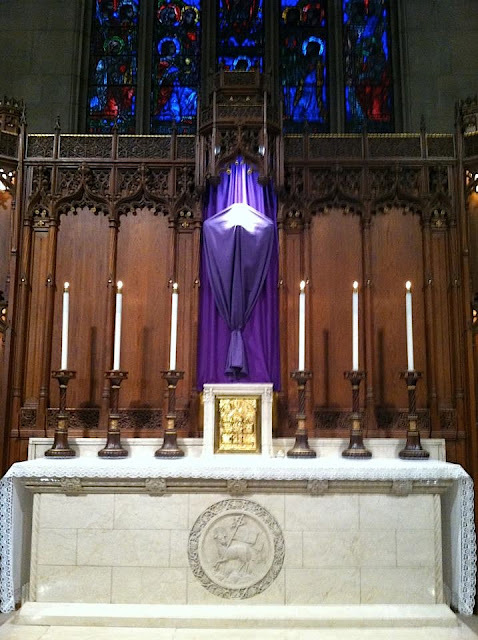 The Liturgical Movement dating back to the early 20th-century had as its principal goal the recovery of a corporate sense of worship: the liturgy is the public prayer of the whole Church, hierarchically ordered. 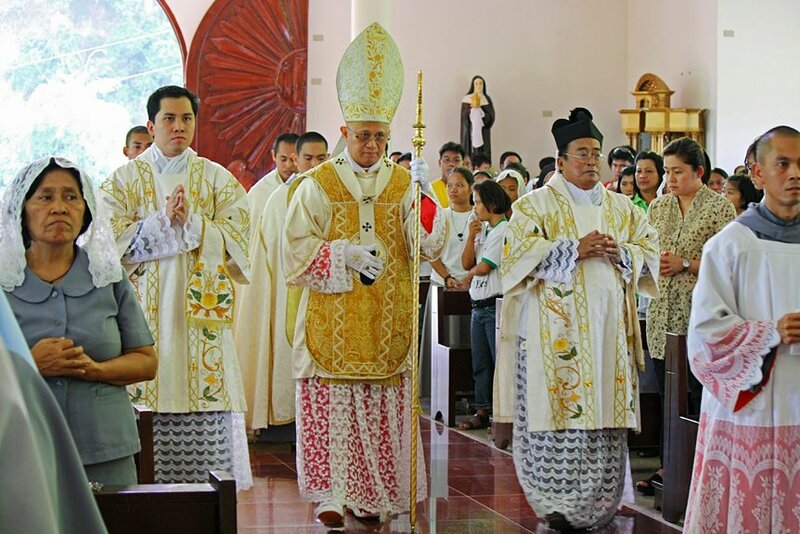 This agenda, as one might expect, involved a renewed emphasis on Solemn Mass—indeed, Mass celebrated by a bishop, with all the orders of clergy and laity present and performing their proper liturgical roles—as the norm of eucharistic celebration. 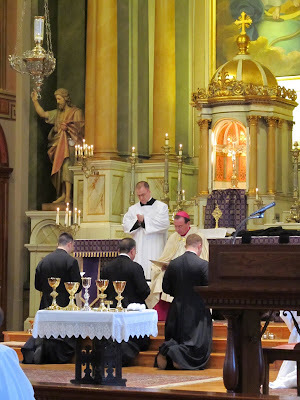 In the liturgical reform initiated by the Second Vatican Council, elements from the solemn form of Mass, when the celebrant was not restricted to the altar, entered the new rite of Mass authorized by Pope Paul VI in 1969. That, I am inclined to think, was a good thing—in fact, one among many good things that are easy to lose sight of when rightly denouncing revolution posing as reform. Every year for Good Friday, authentic liturgical choirs face the great decision of whether to sing the Improperia according to its amazing chant version or to vary that tradition with the introduction of polyphony. It is not easy because the chant edition is impossibly beautiful. It seems a tragedy to ever let the opportunity pass and not sing it. Here it is, and you will see that it doesn't sound like any of the chants throughout the year (though its melody is foreshadowed in this coming Sunday's offertory). On the other hand, some of the most beautiful polyphony sets the same text. This setting is the most famous one by Victoria. If you are drawn more to the English edition, the best version I've seen is by Fr. Samuel Weber, and it can be found among the chants of his new Gradual, which is being posted week by week in his wonderful archive of chant. Early Friday evening, Archbishop Dennis Schnurr conferred the habits of the Oratory of St. Philip Neri to the thee members of the Community-in-Formation in Cincinnati. 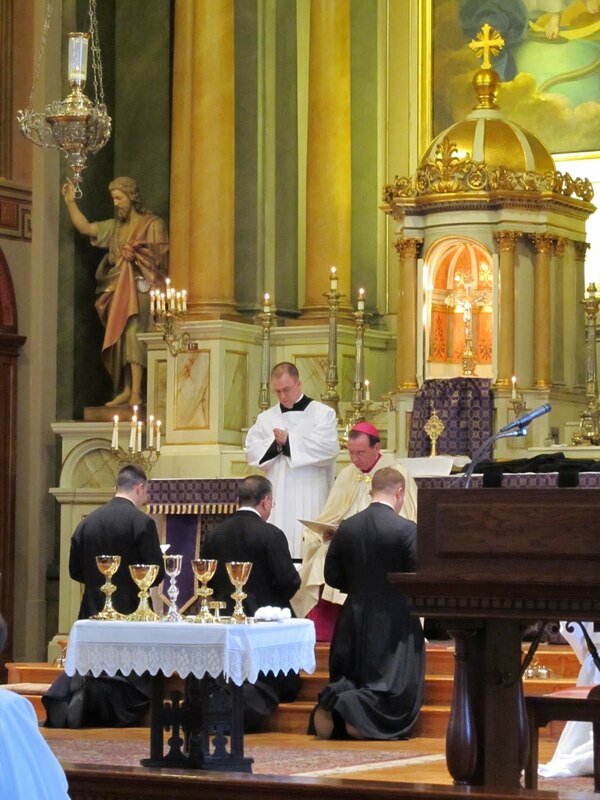 Two seminarians and a priest active in Over-the-Rhine, the future Oratorians mean to bring the distinctive Oratory spirituality to that historic Cincinnati neighborhood, where they will live and work. 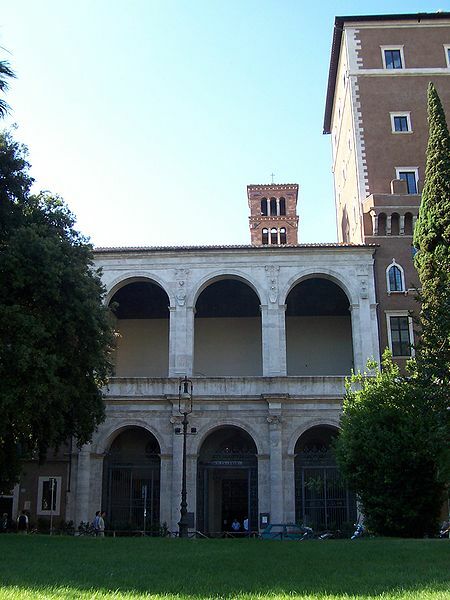 Established in the 16th century by an Italian priest now known as the “third Apostle of Rome” (after St. Peter and St. Paul), the Oratory is halfway between a religious order and the life of a typical secular priest. Like monks, Oratorians take a vow of stability (to live in a certain area), which means they cannot leave for or be transferred to a different Oratory. In most matters, they are under the direction of their Ordinary rather than the local bishop. Like a monastery, an Oratory has a more structured day of work and communal prayer than a typical priest’s residence. But unlike monks, Oratorians can have a variety of apostolates, and can change them at will (under the guidance of the Ordinary). They often work in schools, hospitals, prisons, and other areas where priests are needed. The spirituality of the Oratory is centered on voluntary, joyful service and bonds of friendship. Oratorians do not take vows of poverty, obedience, and chastity; but they offer these things freely in a spirit of love and charity rather than compulsion. Communal life and, especially, communal prayer foster this vocation to service and love. 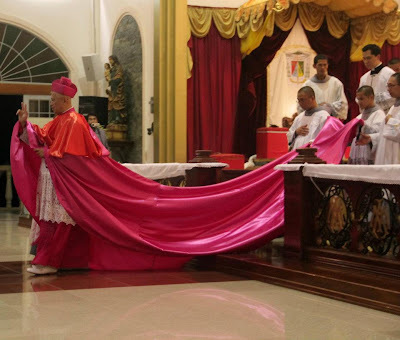 Permission to form an Oratory comes directly from the Pope, and follows recognition from the Confederation of the Oratory in Rome, and the permission of the bishop. There are seven Oratories in the United States, and last March Archbishop Schnurr established the Oratory here. Fr. Lawrence Juarez, Parochial Vicar of Old St. Mary’s, will be the Superior. 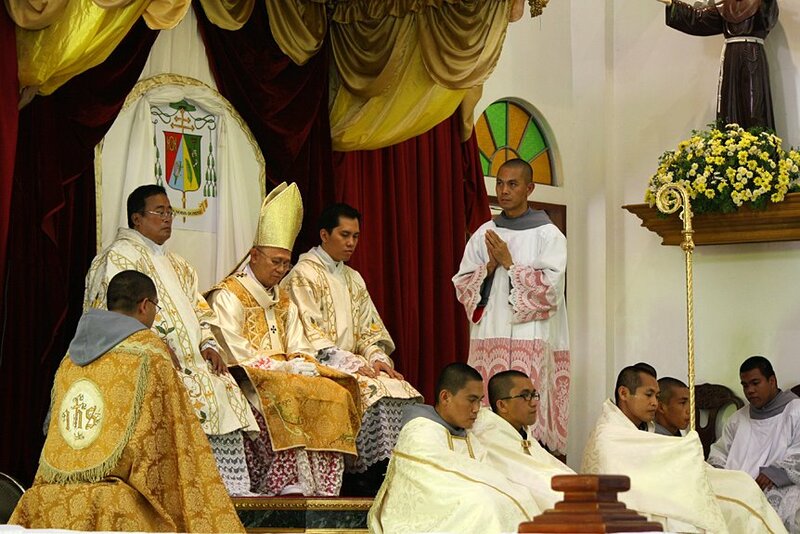 Seminarians Rev. Br. Jon-Paul Bevak and Br. Adrian Hilton make up the remaining members of the congregation. Until the Oratory is approved it will be called a “Community-in-Formation” and will live together for one or two years, according to Bevak, much like a novitiate. The men are currently renovating two houses on Clay Street to use as their “Pious House” residence. Nearly all Cincinnati’s seminarians, as well as several seminary professors bolstered the large crowd of family, friends, and area residents at Friday’s ceremony. Dominican Fr. Paul Keller, Seminary Rector Fr. Benedict O’Cinnsealaigh, Msgr. 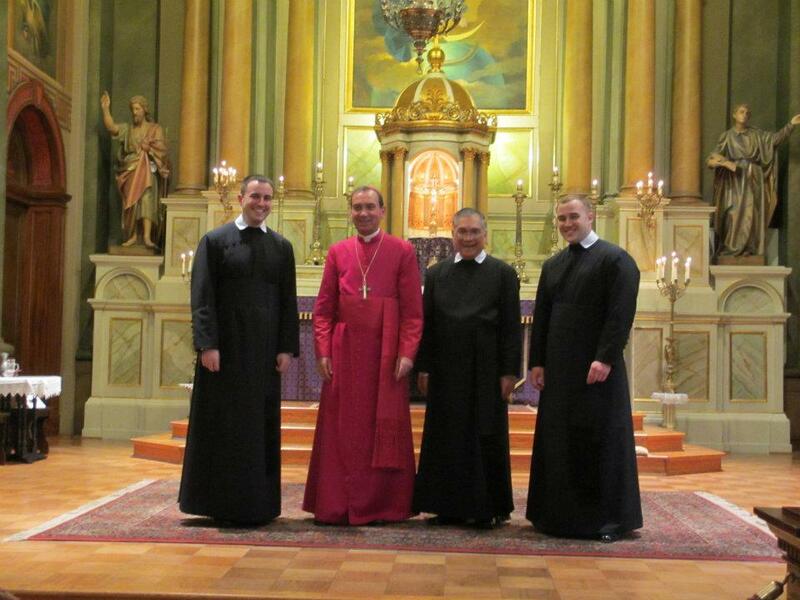 Frank Lane, and others joined the future Oratorians and Archbishop Dennis Schnurr for the ceremony. The choir of Old St. Mary’s sang ancient hymns, the Litany of Loreto, and prayers in between short prayers by the Archbishop and exchanges with the Community-in-Formation. “Most Reverend Fathe we ask that you receive us to wear the habit of our holy father, St. Philip, that we may begin community life with you among the clerics according to the constitutions,” the three men asked the Archbishop, in the words of the centuries-old ceremony. 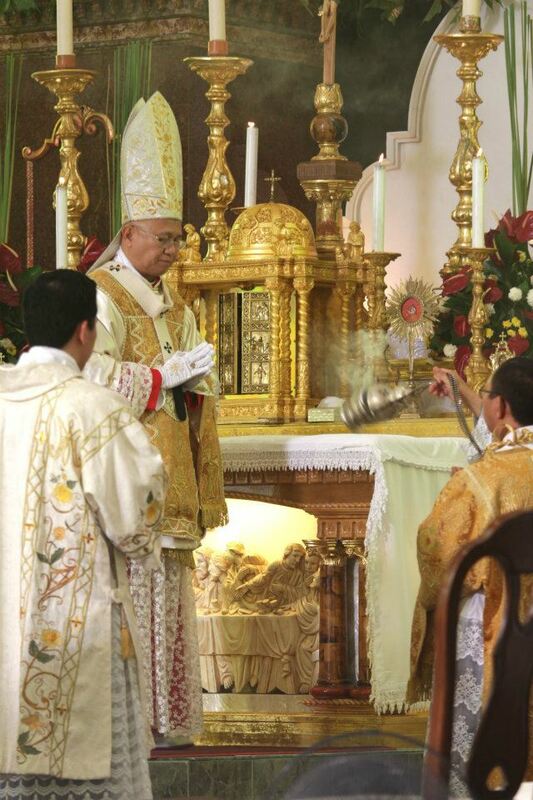 Later in the ceremony Archbishop Schnurr blessed chalices and pattens for use in the Community, and blessed everyone assembled with a relic of St. Philip Neri that they were invited to come forward and venerate. See the Community-in-Formation’s just-launched website here. See a slideshow of Friday’s liturgy at our Facebook Page. Portrait photo courtesy Donna Franer. PORTSMOUTH UK - A sixth Anglican bishop has been ordained as a Catholic priest at a ceremony in Portsmouth today. Fr Robert Mercer, who served as the Anglican bishop of Matabeleland and as a bishop within the Traditional Anglican Communion, was ordained to the Priesthood by the Right Reverend Alan Hopes in St John’s Cathedral in Portsmouth. 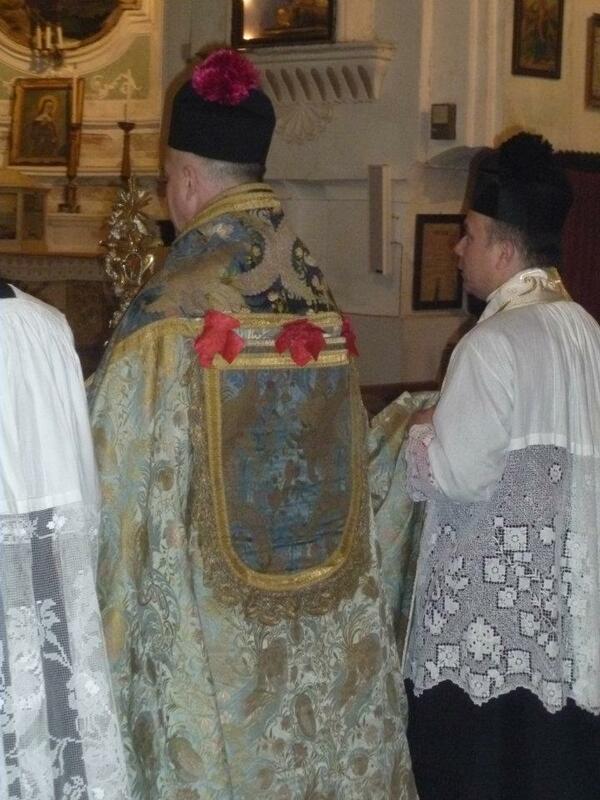 Fr Mercer will serve in the Personal Ordinariate of Our Lady of Walsingham, in England and Wales. This is the first structure, set up in 2011, following the provision of Pope Benedict XVI to allow Anglicans, including members of the Church of England and the Traditional Anglican Communion, to become Catholics whilst retaining much of own traditions and heritage. Serving within the Isle of Wight & Portsmouth Ordinariate Group, Fr Mercer will minister especially to those worshipping at the historic Portsmouth church of St Agatha’s, Landport, who hope to be received into the full communion of the Catholic Church this Easter. 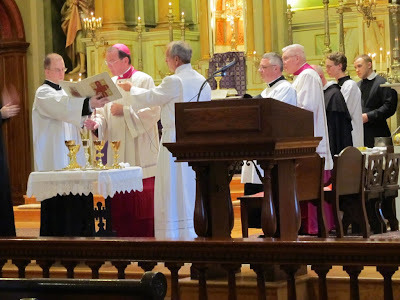 Monsignor Keith Newton, the Ordinary (leader) of the Personal Ordinariate of Our Lady of Walsingham, commented on Fr Mercer’s ordination, saying, “Fr Robert’s witness to the truth of the Catholic faith, and his commitment to the unity of all Christians, has led to this very happy day when we can welcome him as a brother Priest in the Catholic Church. 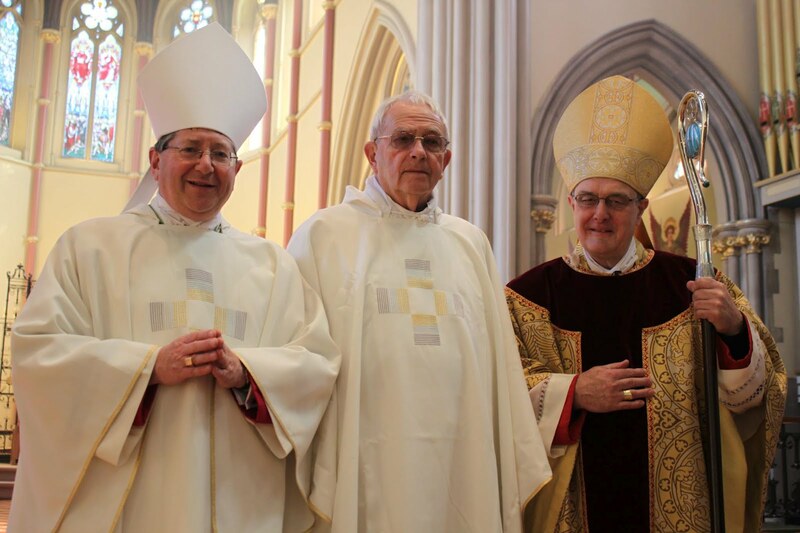 His ministry in Africa, in Canada and here in Portsmouth, has been exemplary, and we look forward to his renewed ministry now - bringing many rich gifts from the Anglican tradition into the Catholic Church”. Fr Jonathan Redvers Harris, who bears overall responsibility for the Isle of Wight & Portsmouth Ordinariate Group, said “As the Ordinariate continues to grow in Portsmouth, it will be good to have Fr Robert’s expertise and great wealth of experience. I welcome him warmly as a colleague and a friend”. Continuing on with some quick coverage of the feast of the Annunciation, I wanted to share a few photos from the diocese of Albenga-Imperia in Italy. 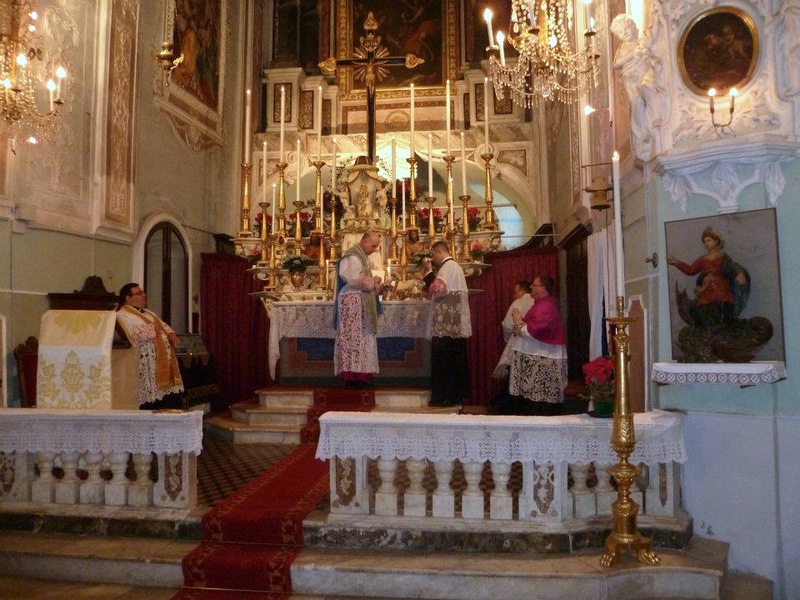 This particular Mass was celebrated in the parish church of Annunciazione di Maria Santissima in Tavole, and was celebrated by the Vicar General of the diocese, Monsignor Giorgio Brancaleoni. One will note some pontifical elements here, such as the use of the Canon Missae on the altar, amongst some other elements. 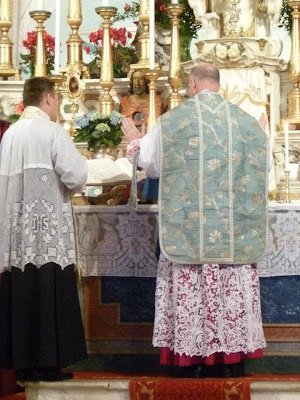 Further, one will no doubt note the use of what are evidently an antique set of blue vestments -- and a beautiful set it is indeed. Invariably the question will arise, 'is this permitted?' 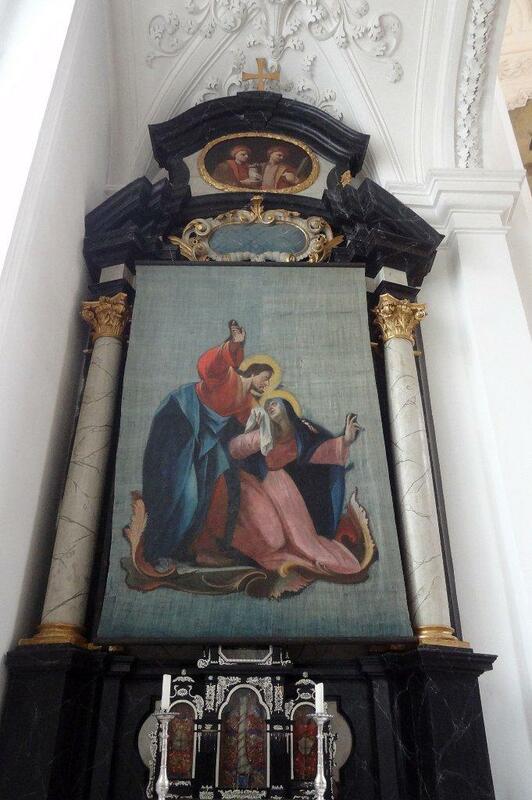 given that this Mass in occurring in Italy and not in places like Spain where permissions for blue do exist. Whether there is a special indult for this particular location I know not, but from what I'm given to understand, the use of blue in parts of Italy for Marian feasts was a strong custom in some parts, whatever else the liturgical law formally was. I only address the topic since it is otherwise bound to arise anyway. 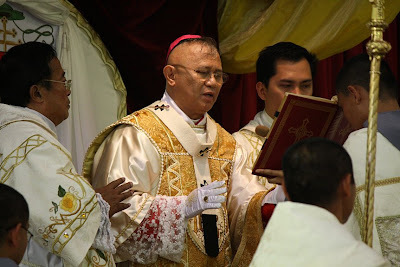 The President of the Catholic Bishops Conference of the Philippines and Archbishop of Cebu, Jose S. Palma, celebrated a Solemn Pontifical Mass according to the usus antiquior this past March 26th for the Feast of the Annunciation. As seems to be so often the case, the Franciscan Friars of the Immaculate lent their valuable assistance for the liturgy. Here are a few photographs of the event which were sent into the NLM. Congratulations to all who helped effect this event. May it be the beginning of many more like it. I am sure by now you all know about this bit of news. I am sure most of you have read the letter. May I encourage you to pray. Pray for good will and good faith to triumph everywhere. It seems to me that now is not the time for focusing on the division, but instead the time to fight for unity and brotherhood. The regularization of the Society's situation would be good for everyone. That is my firm belief. Let us not concern ourselves then in this moment with the debates of what was or what might have been in the past. Nor let us be discouraged by the naysayers or the polemicists. Instead, let us persist in our desire for unity and re-double our efforts toward this goal. Word spread today that a new provost was elected for the London Oratory: Fr. Julian Large. I was able to confirm the accuracy of these reports. Fr. Julian succeeds Fr. Ignatius Harrison as provost of the London Oratory. Fr Julian Large has been elected provost of the Brompton Oratory. The traditionalist priest replaces Fr Ignatius Harrison in the role, with Fr George Bowen elected vice-provost. Elections at the Kensington church, which was built in the 1870s and run by the Oratory of Saint Philip Neri community, take place every three years and the results are announced on the Feast of the Annunciation. 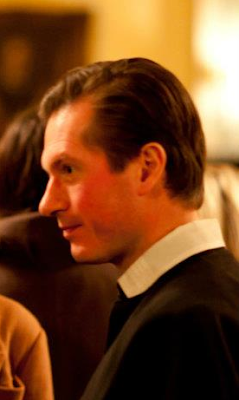 Fr Julian, 43, is a former gossip columnist for the Daily Telegraph, and a convert from Anglicanism. Raised in Merseyside, Fr Julian studied at Mansfield College, Oxford, where he ran the university architectural society. 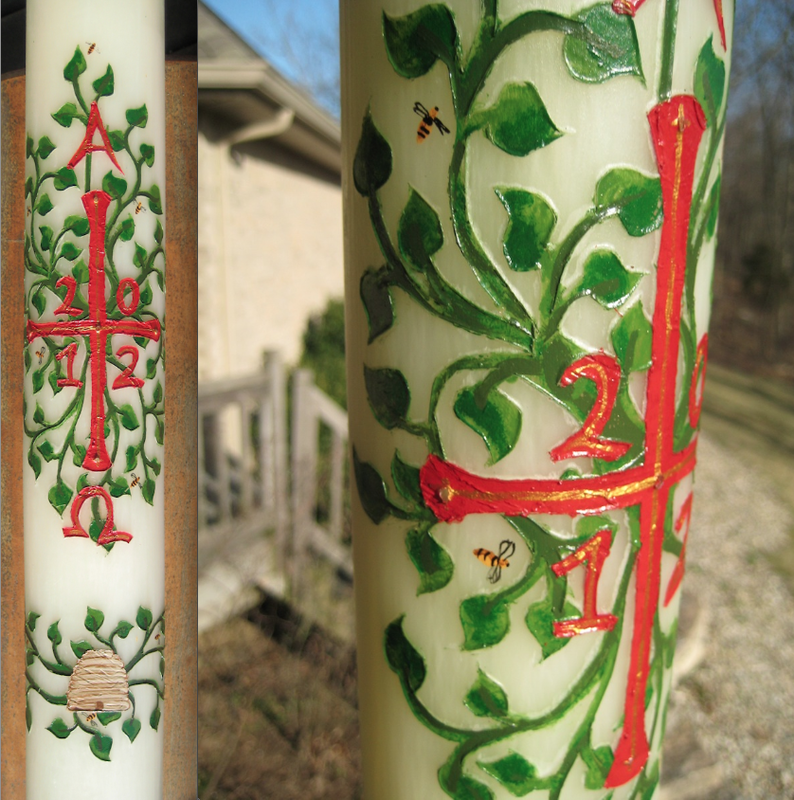 With yesterday being Passion Sunday, we enter the time when it is traditional for crosses and images to be veiled. A couple of our readers sent in some photos of the veiling as manifest in their parishes. 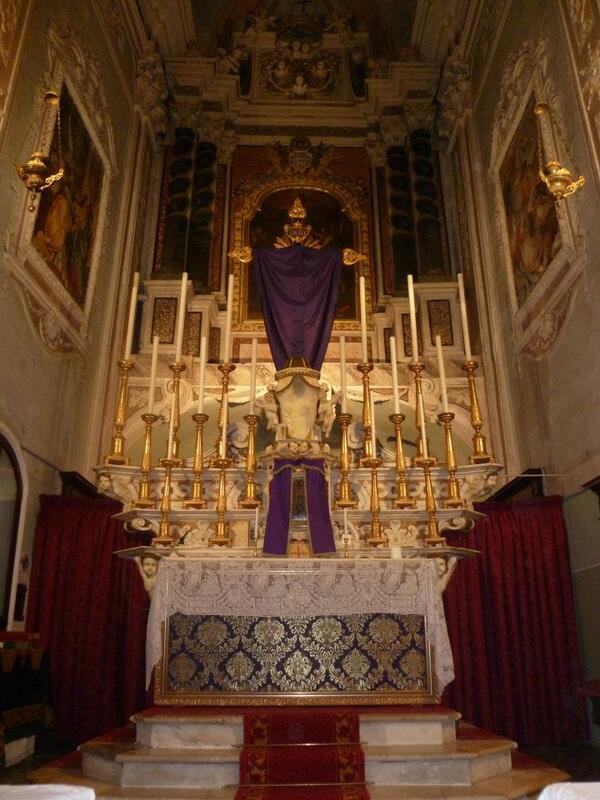 On Passion Sunday, the Lenten station is kept at the Basilica of St. Peter in the Vatican. 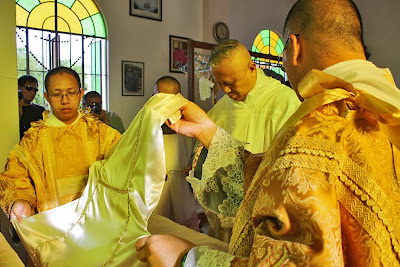 Each year on this day, Vespers is celebrated with particular solemnity, and one of the most beloved rituals of Rome's liturgical year is done, the exposition to the faithful of the Veil of St. Veronica. 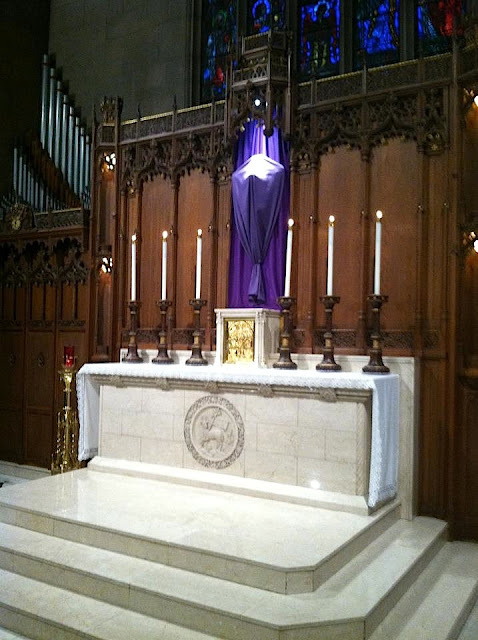 The altar is decorated with relics in a special arrangement, as also on the Ember Saturday of Lent.